Will Pandora Media Inc. Break Its $4 Billion Promise? Will Pandora’s new CEO scrap the company’s plans to generate $4 billion in sales by 2020? Back in February, Pandora (NYSE:P) laid out a five-year plan to more than triple its annual revenue to $4 billion by 2020. It claimed that $2.4 billion would come from its traditional ad-supported streaming business, $1.3 billion would come from a new tiered-pricing subscription service, and the remaining $300 million would come from its ticket and live events businesses. However, the abrupt departure of Pandora CEO Brian McAndrews, who engineered that plan, cast serious doubts on the $4 billion promise's future. Wedbush Securities analyst Michael Pachter told CNBC that McAndrews "probably got bounced for being a little too ambitious". It's unclear if McAndrews' successor, co-founder Tim Westergren, will keep pursuing the $4 billion target, but investors should do the math to see how much Pandora's revenue can realistically grow within the next five years. Pandora's new CEO Tim Westergren. Source: Pandora. Last year, Pandora's total GAAP revenue rose 26% to $1.16 billion. 80% of that total came from advertising, 19% came from Pandora One subscriptions, and less than 1% came from Ticketfly's ticket sales. Ad sales rose 27%, subscription sales climbed 17%, and ticketing sales included just two full months of revenue at the end of the year. For Pandora's core advertising business to grow from $933 million in 2015 to $2.4 billion in 2020, it must grow at a compound annual growth rate (CAGR) of 21%. That might sound reasonable based on its 27% growth rate in 2015, but that figure actually represents a slowdown from 56% growth in 2013 and 40% growth in 2014. If that slowdown continues, it could be tough for the business to maintain a 21% CAGR through 2020. For Pandora's subscription business to grow from $221 million in 2015 to $1.3 billion within five years, it would need to grow at an even higher CAGR of 43%. That would be a huge jump from 17% sales growth in 2015, which also represents a major slowdown from 51% growth in 2013 and 38% growth in 2014. Pandora believes that replacing Pandora One's $5 per month subscription fee with a wider variety of cheaper and pricier options might generate fresh sales growth. Pandora's mobile app. Source: iTunes. However, Apple (NASDAQ:AAPL) and Spotify already dominate the subscription-based streaming market with $10 per month fees, which suggests that pricing isn't the main issue -- it's the fact that Pandora is generally considered a "free" streaming service. Apple claimed that it had 10 million paid subscribers at the beginning of the year, which already translates to $1.2 billion in annual revenue. Spotify reported $1.2 billion in sales in 2014, its most recently disclosed year. Both figures already nearly eclipse Pandora's five-year goal. Lastly, Ticketfly only generated about $5 million in monthly revenue in the last two months of 2015. The company believes that it can grow its annual revenue to $80 million to $90 million this year. Assuming that it can actually hit that target, sales would still need to rise at a CAGR of 35% between 2016 and 2020 to reach $300 million. Bigger competitors like Live Nation's (NYSE:LYV) Ticketmaster, which generated $1.6 billion in revenue last year, could make it tough for Ticketfly to hit that target. Since Pandora's business is mainly ad-based, it must play more songs to generate more revenue. But the more songs it plays, the more royalties it pays to record companies. That's why content acquisition costs rose 37% annually and gobbled up over half its revenue in 2015. Pandora's total active listeners also fell 0.5% annually to 81.1 million in the fourth quarter as total listener hours climbed 3% to 5.4 billion -- meaning that it paid higher royalty expenses to play more songs without gaining new listeners. Under McAndrews, Pandora's expansion required a lot of spending. It spent $450 million on Ticketfly and $75 million for the assets of rival Rdio, and plans to spend $345 million this year to scale up its infrastructure and launch new services. 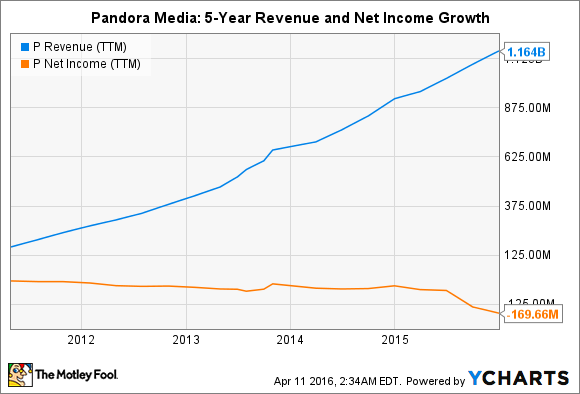 All those expenses will likely cause Pandora's losses to widen even as its revenue climbs. Westergren hasn't said much about Pandora's $4 billion promise, but simple math suggests that the target will be revised or scrapped. Westergren could also scale back McAndrews' expansion plans in favor of improving profitability, but doing so could reset Pandora's attempts to grow its subscription business to effectively compete against Apple, Spotify, and other rivals. Therefore, Pandora is still stuck between a rock and a hard place, and I would steer clear of this stock until management can provide more realistic long-term sales growth targets.